Bruno has a home! 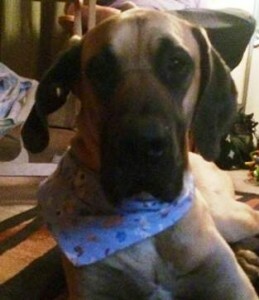 - Rocky Mountain Great Dane Rescue, Inc.
Bruno has a home with Zack & Braelyn in Minot, ND!!! Bruno will be the couple’s first Great Dane. Zack grew up with Mastiff’s and is excited about owning a Gentle Giant of his own. They currently own a young female Corgi who is in a need of a companion to play with. The couple is active and is looking forward to Bruno becoming a part of their family. Way to go, Bruno!! !